In the world of interior design, contemporary kitchens with sleek, minimalistic features are a favourite with many. However, the general public may be less inclined towards this style of kitchen, believing it to be lacking in warmth or personality. However, there is a middle ground, in which you can create a modern looking kitchen which is still inviting and full of character. One of the most significant aspects of such a kitchen is the layout; here are a few of the more popular layouts for contemporary kitchens with a twist. The island layout is by far the most well liked modern kitchen design. It’s ideal for those with homes that are slightly larger than average, as an island can take up quite a bit of space. In a modern kitchen, the island in this type of layout can have a variety of functions; some like to install a hob or a sink for cooking and washing up, whilst others might prefer to use it as a dining and food preparation area. A canopy is often installed above the kitchen island, so that pots and pans can be hung here. Another shape that is great for those who want to combine the contemporary with the traditional is the L-shaped kitchen. This is especially suited to those who have a limited amount of space for the kitchen. The L-shape can be curved for a more modern look, or left as a standard angled shape for those who prefer the slightly more traditional approach. This type of kitchen is perfect for homeowners who want to include the dining area in the kitchen whilst still maintaining a slight separation between the two sections. Many people who are living in larger cities will know the trials and tribulations of having to deal with tiny kitchens in their small city flats. This is where the U shaped kitchen comes into being. This kind of kitchen uses three walls of the room, hence the term U shaped. It allows people to separate the cooking area with the hob and oven from the food preparation area and generally creates the appearance of a more spacious room. 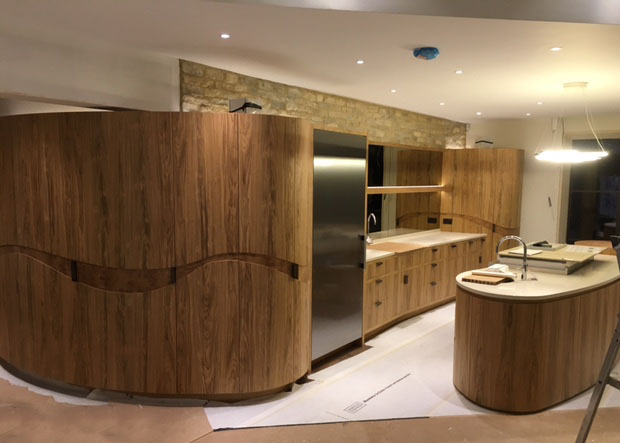 One very traditional kitchen layout which is now being given a modern twist is the galley shaped space. This form of kitchen design is perfectly suited to the larger household, as it provides space for family members to prepare meals alongside each other. Because people often like to make the kitchen a social space as well as a functional one, the galley kitchen layout is a well loved choice, as it provides enough room for people to relax and enjoy each other’s company whilst they prepare a meal. The beauty of contemporary kitchens is that they allow for almost any kind of design or layout that appeals to you; so whether you want an entirely modern look, with sleek metal countertops and chic furniture, or something that leans a little more towards the traditional, you can find a design to suit you and your lifestyle.